Harvey Weinstein is a disgraced movie producer who will be remembered as one of the most vile sexual predators to ever emerge from Hollywood. But before the “open secret” of his crimes truly became open, Weinstein was hobnobbing with politicians nearly as often as he was making movies. One of those politicians was President Bill Clinton. 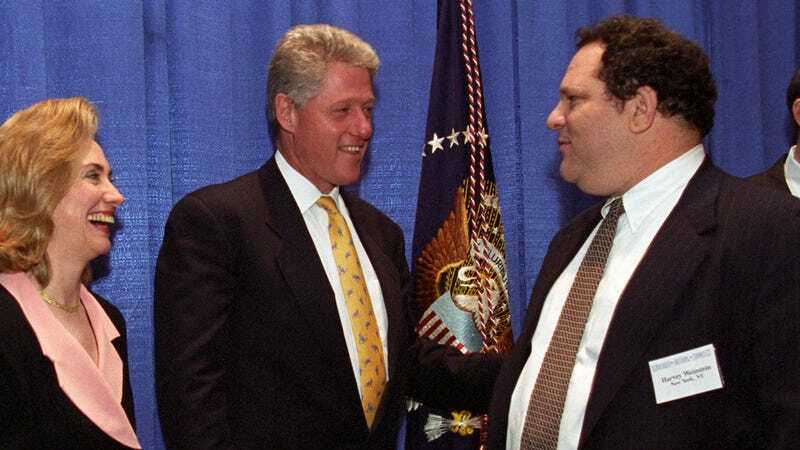 I submitted a Freedom of Information Act (FOIA) request with the Clinton Presidential Library, a part of the National Archives system, for all previously unreleased photos that it holds of Harvey Weinstein. The request yielded an estimate of 2,167 individual photos, most of which aren’t of Weinstein, but feature events that he attended at the White House, Camp David, and at private events. The presidential libraries process FOIA request photos by the film roll and event. What does that mean? If, for example, there are 200 photos taken at an event and only one has Harvey Weinstein, the 200 photos are all counted in the 2,167 total. But we didn’t get access to necessarily every photo of the Clintons with Harvey Weinstein. There are some redactions for events that are marked “personal.” This isn’t unusual since the presidential libraries protect photos that are considered private, but it still makes us wonder what those events looked like. When we obtained photos of Steve Jobs from the Clinton Presidential Library, for example, photos taken at a private screening of A Bug’s Life at Camp David in 1998 were redacted. We’d still love to see those. The photos released through FOIA span from 1995 to 2000 and provide a glimpse of Weinstein’s proximity to the presidency during those years. High resolution scans of the photos cost $16.50 a piece, so we didn’t order every possible photo. But if you’re so inclined, you can order them for yourself through the William J. Clinton Presidential Library and Museum. We’ve highlighted a few of the photos from the FOIA release below, though they’re taken from low-resolution contact sheets. We’ve uploaded all of the contact sheets to Archive.org if you want to take a look at the entire FOIA request.